CFA Program Awareness Scholarships 2016 are merit or role-based opportunities available to qualified applicants in the media, academic, and financial communities. Awareness Scholarships are awarded as applications are received (before the deadline) and processed. Recipients of the June scholarship may only apply it to the upcoming June exam (Levels I, II, and III). Recipients of the December scholarship may only apply it to the upcoming December exam (Level I). - Complete your application using the online edit function in the PDF. - Print the completed form and then add your signature and date. 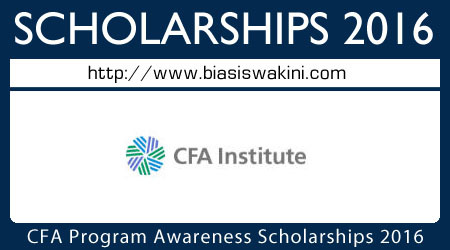 - Scan and email the completed application as an attachment to scholarships@cfainstitute.org. Keep your email copy for your records. 0 Komentar untuk "CFA Program Awareness Scholarships 2016"